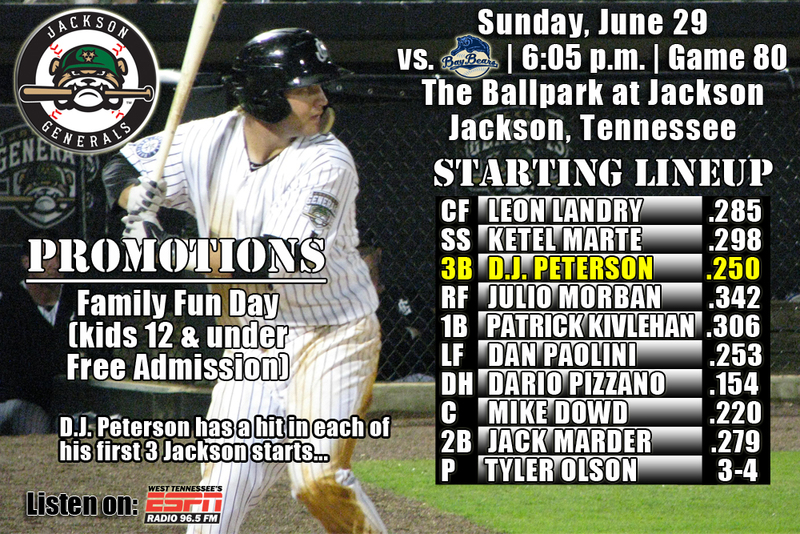 • Tonight the Generals continue a 10-game homestand with game one of a five-game series against Mobile. The Generals went 1-4 against Tennessee in the first leg of the homestand…are 3-7 against Mobile this season. • Starter Matt Anderson allowed only 1 unearned run through 7.0 innings to lead the Generals to a 2-1 win over Tennessee on Saturday. The win snapped a 5-game losing streak. • Anderson (7.0,5,1,1,0,5,WP) tossed 4.0 scoreless innings before allowing an uneared run in the top of the 5th inning. Overall he struck out 5, walked none and issued only 5 hits to earn his 3rd AA win. • RH Richard Vargas (2.0,1,0,0,0,3) earnd his 3rd save, after striking out 3 batters in 2.0 scoreless innings to close out the game. SS Ketel Marte (2×4, RBI) and DH Julio Morban (2×4, 3B) each recorded 2 of the team’s 10 hits, while Marte and LF Dario Pizzano (1×3, 2B, RBI) each drove in 1 of the 2 Generals runs. • Jackson’s 2-1 win on Saturday was the first win on a Saturday since the first of the season on 4/6 at CHA (2-11). • It also snapped a 5-game losing streak to TNS and was just 2nd win in nine chances against TNS in Jackson this season. • The 6,683 crowd was the third-larges in franchise history and marked the second sellout of the season. The last time the franchise had two sellouts in a season was 2004. • OF Julio Morban his hit safely in his last 6 consecutive games, batting .458 (11×24) with 3 runs scored, 2 doubles, 1 triple and 1 walk. doubles, 2 triples, 4 RBI, 3 walks and 8 stolen bases. runs scored, 4 doubles, 1 home run, 3 RBI and 3 walks. • C John Hicks has hit safely in 9 of his last 11 games, batting .341 (14×41) with 6 runs scored, 4 doubles, 3 RBI, 4 walks and 2 stolen bases. • Since May 24, INF Jack Marder has hit safely in 20 of 25 games with 10 multi-hit efforts, batting .356 (32×90) with 16 runs scored, 5 doubles, 2 triples, 3 home runs, 12 RBI and 5 walks. • Since May 22, RH Matt Anderson is 3-1 with a 2.01 ERA (9 ER, 40.1 IP) in his last 7 starts. • Jackson is 12-12 in June with a .299 AVG which ranks 2nd in the league and seven Generals are batting over .300 this month. • D.J. Peterson, the No. 2 prospect for the Mariners, according to Baseball America and was Seattle’s 12th overall selection in the 2013 draft out of New Mexico. Peterson has a hit in each of his first three Jackson games. • On Tuesday, Peterson was named to the U.S. Team for the upcoming 2014 SiriusXM All-Star Futures Game. Peterson will be joined at the All-Star Futures Game by High Desert outfielder Gabby Guerrero, another one of the Mariners top young prospects. Guerrero will play on the World Team at the July 13 game at Target Field in Minneapolis as part of the All-Star Week festivities.